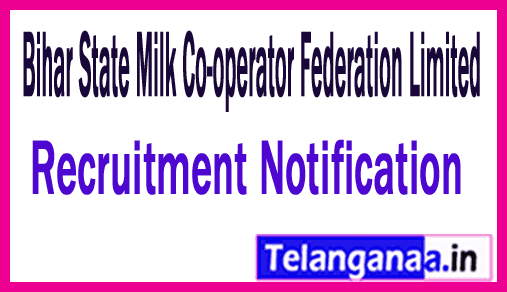 An employment notification has been issued by the Bihar State Milk Co-operator Federation Limited under the name of COMFED recruitment. For ambitious, enticing and active job applicants, the applicant needs to fill the application through online mode, for 80 posts of Junior Technician entering through his official website through online mode. The last date is 8 February 2019. The person who is willing to take advantage of this latest inauguration will have to apply against COMFED jobs and through this page, you can get more information about COMFED recruitment 2019, which is available at www.telanganaa.in . Eligibility Criteria: Candidates must have completed 10th / ITI or equivalent with good marks from any recognized university / institute. Candidates applying for any of the above posts and candidates belonging to General / OBC category will have to pay the application fee. 700 / -. The candidates of SC / ST category will have to pay Rs. 350 / - in the form of application fee. Candidate should not exceed 37 years (male), 40 years (female). Salary and pay band: For successfully recruited applicants for junior technician Rs. Will get attractive and impressive salary. 5200 - 20,200 / - 2000 / - with grade pay organization. Selection of applicants for Junior Technician will be based on written examination, interview. Job searchers who want to apply for COMFED jobs will have to go to the official site http://www.sudha.coop. The last date for submitting applications online is: 8th -02-2019. Click COMFED recruitment notification here. COMFED Bihar State Milk Co-operative Federation Recruitment Notification 2017 The Post of Marketing Consultant-Last Date 12-05-2017. Educational Qualification - Certificates of Academic & Professional qualifications & statements of marks of all the qualifications for all semesters/ years (10th, 12th, Diploma/ Graduation/ Post-Graduation as applicable). Selection Process - On written test/ Interview.